Local soldiers collect dead fish for proper treatment on a beach in Quang Binh Province, located in north-central Vietnam, on April 25, 2016. With a number of dead fish washed ashore on several beaches in the north-central province of Quang Binh over the weekend, local residents have been rushing to collect them to sell to traders, even not knowing what the buyers would do with the dead animals. Quang Binh is one of several central provinces including Ha Tinh, Quang Tri and Thua Thien-Hue that have witnessed the mysterious mass fish deaths occurring since the beginning of this month. The phenomenon stopped for a while last week but seemed to return on Sunday. Dead fish of various species and sizes have been seen scattered on the Da Nhay beach in Thanh Trach Commune, Bo Trach District on Sunday and Monday. They looked quite fresh and had yet to begin rotting. 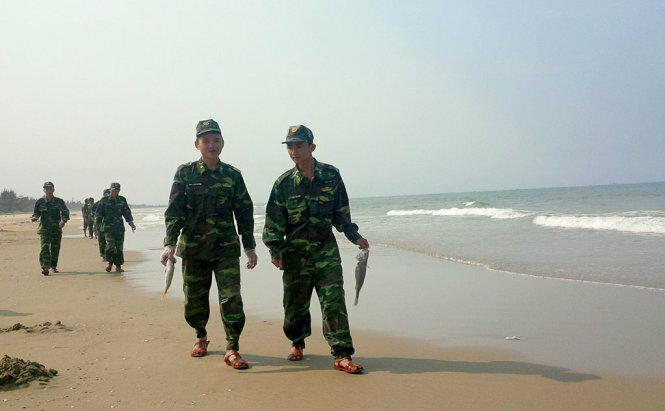 A local military unit sent its soldiers to the beach to collect the dead fishes, which were later buried to avoid polluting the environment. However, many traders, who appeared out of nowhere, have brought refrigerator trucks to the area, offering to buy the dead fish. The vans came twice a day, with local fishermen and residents eagerly collecting the dead fish to sell for more than VND50,000 (US$2.23) a kg. “My husband just joined many others who rushed to the beach to pick up the dead fishes,” Cuc, a local resident, told Tuoi Tre (Youth) newspaper on Monday. Cuc said her husband earned nearly VND200,000 ($8.92), adding that traders behind the refrigerator trucks had purchased “tons of dead fishes” over the weekend. Nguyen Van Lao, chairman of Thanh Trach Commune, confirmed that traders had been buying dead fishes from locals over recent days, but did not comment further. It remains a mystery as to what traders will do with the dead, possibly toxic, fish. Concerns have emerged that the dead fish will be sold to southern markets, including Ho Chi Minh City, or turned into fish sauce. A subsidiary of Taiwanese conglomerate Formosa in the north-central province of Ha Tinh is under scrutiny as its submarine wastewater pipeline is suspected of causing the mysterious mass fish deaths along Vietnam’s central coast. The system, stemming from a Formosa-developed steelmaking plant that uses toxic chemicals in production, may have dumped wastewater directly into the Vung Ang Sea in Ha Tinh. The company, Hung Nghiep Formosa Ha Tinh Steel Co. Ltd., was inspected by the Ministry of Industry and Trade on Tuesday.